By hungry runner on October 22nd, 2010 . Filed under: Halloween, Home Decor, Kitchen . 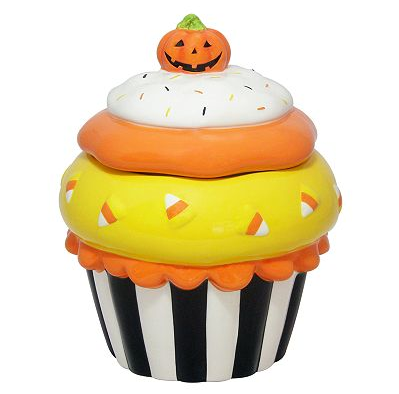 Although it’s no longer available online, some Kohl’s stores still have the Halloween Cupcake Cookie Jar in stock. Be sure to check your local Kohl’s store soon before they are gone; keep in mind, Halloween is a little over a week away and the cookie jar is on sale! « Want an idea for Wicked Cupcakes? I just picked one up for $13.49!!! What a steal! Where did you find it. I have looked and looked for one, got one last year and my husband dropped the top.